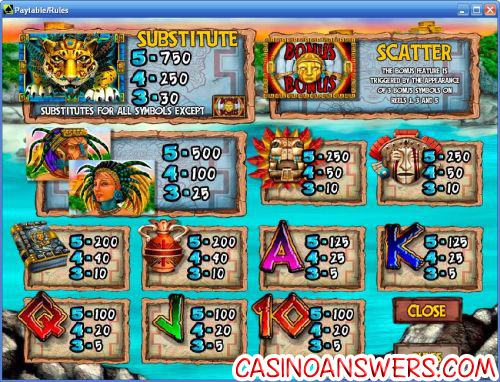 Golden Jaguar Video Slot Guide & Review - Casino Answers! Golden Jaguar is a 5-reel, 50-line video slot developed by Cryptologic, featuring stacked wild substitute symbols and a free spins feature. You can play the Golden Jaguar video slot game at InterCasino and Casino Joy. Bets on the Golden Jaguar slot machine are $0.01, $0.02, $0.03, $0.04, $0.05, $0.10, $0.15, $0.20, $0.25, $0.50, $0.75, $1 and $2. This gives the slots player a decent betting range to choose from. You can bet from 1-50 lines when playing the Golden Jaguar video slot. The lowest amount you can bet on Golden Jaguar is $0.01 per spin, making it a penny slot. You can bet as high as $100 per spin. To play all 50 lines on the Golden Jaguar slot game, hit the “Bet Max” button or for other bets, press the “Spin” button. The Golden Jaguar symbol is wild, meaning it will substitute for all other symbols on the Golden Jaguar slot game (except the scatter symbol). 5 Golden Jaguar symbols on an active payline will pay out up to 750 coins, which is better than it sounds. Due to the fact that the Golden Jaguar is a stacked wild symbol, it is very easy to fill the entire reels with Golden Jaguar symbols, meaning you can hit the top jackpot up to four times on a spin! If you’re lucky enough to do that, you will instead win 3,000 coins. The Golden Jaguar symbol is animated when completing a winning combination and will play a jaguar roar sound effect as it takes a swipe at you. When you hit three scattered bonus symbols anywhere on the reels of the Golden Jaguar online slot machine, you will trigger the free spins feature. You will win 7 free spins and up to an 8X multiplier. Other available multipliers are 2X, 3X, 4X or 5X. The free spins feature can be re-triggered up to 13 times. The scatter symbol only appears on reels 1, 3 and 5. Golden Jaguar’s autoplay feature gives you the ability to play up to 999 autoplay spins. You can set it to stop on cumulative win (up to $5000), cumulative loss (up to $5000) and on a single win (up to $5000). You can stop autoplay at any time on the Golden Jaguar Cryptologic video slot. 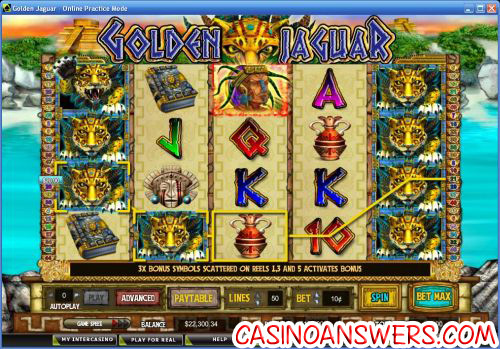 Golden Jaguar is a good 50-line video slot, but it could use a few more special features. Besides that, the graphics, sounds and animations are all excellent. The stacked wilds come up very frequently and end up leading to most of the wins you’ll receive in the game. To play the Golden Jaguar video slot, sign up and make your deposit today at InterCasino! Are players from the United States of America able to play the Golden Jaguar casino slot? While USA-based slots players cannot play the Golden Jaguar video slot game for real money, they can head over to the USA-friendly Aladdin’s Gold Casino where they can find several video slots with similar themes – one of which featuring a jaguar. Aladdin’s Gold offers Aztec’s Treasure, Aztec’s Treasure Feature Guarantee, Incan Goddess and Mayan Queen. Can I play a free Flash game of the Golden Jaguar video slot? Unfortunately, the Instant Play casinos at InterCasino and Casino Joy only offer real money play rather than free practice play. However, if you are looking to play the Instant Play version of the Golden Jaguar slot game, you’ll be able to find it there. If you experience issues with the Flash casino software, try downloading the latest version of Adobe Flash Player. Where can I play the Golden Jaguar slot flash game?